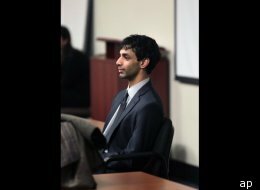 Today former Rutgers University student Dharun Ravi, 20, was found guilty of invasion of privacy and bias intimidation for using a web cam to tape his rommate, Tyler Clementi during a private intimate moment with another man in the room that they shared. The guilty verdict was announced today in a New Brunswick, New Jersey courtroom. Dharun Ravi showed the video to his friends and even publicized the second taping on his twitter account. Unfortunately, due to the embarrassment and posting of the video on twitter by Ravi, Clementi jumped to his death days later off the George Washington Bridge. Due to Dharun’s actions, he could serve up to 10 years in a state prison. Even though most of his family is here in the U.S., he may also face deportation back to his native country, India. He will be sentenced on May 21, 2012. Ravi committed this act was he was only 18, which makes him an adult, no matter how childish his actions were. He made a choice to embarrass his gay roommate for his own amusement and maybe, even an attempt to get praise from his friends. I’m sure he didn’t know his taping would lead to the death of his roommate, but he had to know it would cause his pain and embarrassment. I also see the friends of Dharun Ravi responsible, too, because they viewed the video. Some even helped to set-up the web cam. Most importantly, they stood by and did nothing to stop the taping or to report the taping. I hope this case serves as a cautionary tale of what not to do when using online technology and social media. Many teens and young adult try to gain popularity by “shaming” others who they perceive as different, strange or weird without considering the “legal” consequences of their actions. If you are upset with someone, think about this case before you send out that tweet, text or email. Thanks, Leslie! I like your pregnancy pics. I’m preggo, too. This is number two for me. Congrats! Congress Ravi I hope you are a nice man, who can make their life best.